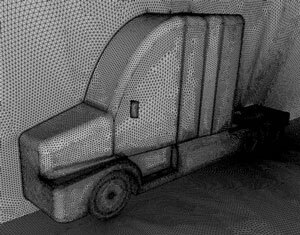 The SOLUS Team provides cutting edge aerodynamic analysis, design and consultation. SOLUS has in-house computational capabilities using the award winning TetrUSS design suite. The TetrUSS code is a proven stable and reliable multiplatform system for unstructured Euler and Navier-Stokes computational fluid dynamic analysis. The SOLUS computer cluster consists of 4 nodes each with dual 2.0 Ghz PowerPC G5's and 5Gb of ram. Click here to see a chart presenting the scaling performance of the SOLUS cluster. SOLUS team members are nationally and internationally recognized experts in experimental aerodynamics. 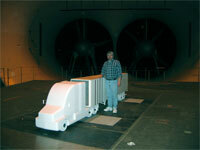 SOLUS offers state-of-the-art wind tunnel test support and heavy truck aerodynamic technology assessment capability.